At the UFC Fight Night 91 weigh-ins, all 24 fighters taking part in Wednesday’s UFC Fight Night 91 fights will step on the scale Tuesday afternoon, and we’ll have the live video here at MMAFighting.com. In the main event, Michael McDonald and John Lineker will have to make the bantamweight limit of 135 pounds. The UFC Fight Night 91 ceremonial weigh-ins will begin above at 5 p.m. ET. The official weigh-ins occurred Tuesday morning in Sioux Falls. Check out the UFC Fight Night 91 weigh-in results below, provided by the South Dakota Athletic Commission. LAS VEGAS — Will Brooks talks about his win over Ross Pearson, what it was like fighting in the UFC for the first time, how far away he is from the title and more. LAS VEGAS — UFC 200 nearly lost another main event. Miesha Tate almost missed the two-hour window to weigh-in Friday morning here at the Monte Carlo. If Tate would have checked in after 10 a.m. PT, her main event title fight with Amanda Nunes would have been called off, per UFC spokesperson Dave Lockett. Tate hit the scale and made weight (134.5 pounds) at about 10:02 a.m.
Kelvin Gastelum and Johny Hendricks also narrowly made the window between 8 a.m. and 10 a.m. Hendricks missed weight at 171.25 pounds and has to forfeit 20 percent of his fight purse to Gastelum. Gastelum made weight at 171 pounds. Both weighed in before Tate, just before 10 a.m. This is a brand new morning weigh-in procedure being used for the first time in Nevada and details like this are still being hammered out. The UFC petitioned the Nevada Athletic Commission (NAC) for early weigh-ins, because they benefit the health and safety of fighters. The NAC approved the procedure last month. Nevada Athletic Commission executive director Bob Bennett said if Tate or any other fighter missed the two-hour window, that would be something he and his team would discuss with the UFC and hope to resolve. However, if a fighter missed the two-hour window and then missed weight as well, the fight would likely be off, he said. “It’s incumbent on the UFC, it’s their responsibility to get their fighters there within that amount of time,” Bennett said. No one else missed weight Friday morning. The fighters will still attend a ceremonial weigh-in for television broadcasts Friday afternoon where these official weights will be announced. The UFC has already used the morning weigh-in procedure in Los Angeles and Ottawa. The plan is to continue using it all summer, including stops in Chicago, Vancouver and Atlanta, according to UFC vice president of athlete health and performance Jeff Novitzky. The early weigh-ins have been met with nearly universal approval by fighters and teams. 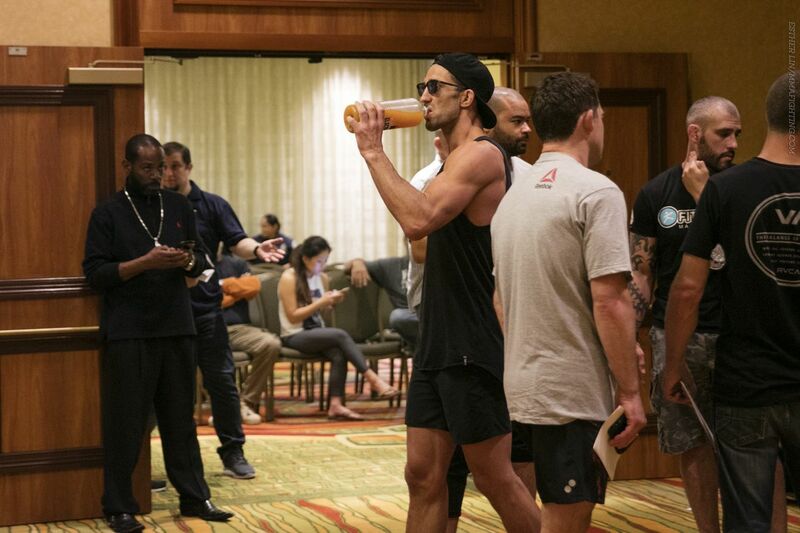 Athletes now have a longer amount of time to rehydrate before the fight and don’t have to sit dehydrated waiting for the TV weigh-in show to begin. UFC 200 lost its original main event this week when Jon Jones was flagged by USADA for a failed out-of-competition drug test. Jones’ would-be opponent Daniel Cormier will now face Anderson Silva in a non-title bout. The women’s bantamweight title fight between Tate and Nunes is now the main event and Brock Lesnar vs. Mark Hunt is the co-main. At the UFC 200 weigh-ins, all 24 fighters taking part in Saturday night’s UFC 200 fights will step on the scale Friday evening, and we’ll have the live video here at MMAFighting.com. In the main event, Brock Lesnar and Mark Hunt will have to make the heavyweight limit of 265 pounds. The UFC 200 weigh-in takes place at 6 p.m. ET, and the video is above. Check out the UFC 200 weigh-in results below. CES MMA 36 goes down Friday night at Twin River Casino in Lincoln, R.I., and will be televised live on AXS TV beginning at 9 p.m. ET/6 p.m. PT. MANHATTAN BEACH, Calif. — Luke Rockhold sauntered out of a conference room at the Marriott Manhattan Beach on Friday morning. He flipped off his glasses, grabbed a piece of paper to sign and exhaled. The weight cut was over. A nearby reporter asked the UFC middleweight champion what it was like weighing in earlier in the morning rather than the usual time of 4 p.m.
For the first time at a UFC event, fighters were able to weigh-in beginning at 10 a.m. Friday. The athletes had a four-hour window to hit the scale at the fighter hotel, rather than waiting until the usual 4 p.m. weigh-in show at the arena. The new rules are part of a package passed recently by the California State Athletic Commission (CSAC) to battle severe dehydration in MMA and boxing. Rockhold and his UFC 199 opponent Michael Bisping both weighed in before 11 a.m. So did co-headliners Dominick Cruz and Urijah Faber. In fact, all but two fighters on the card — Sean Strickland and Clay Guida — hit the scale and were done with their weight cuts before the clock hit 11. Strickland and Guida trickled in not long after. The process went smoothly and fighters raved about it afterward. “This is 100 times better,” Cruz said. The 4 p.m. weigh-in show will still take place with the official weights from the morning announced. The UFC and CSAC preferred to keep those weights embargoed until the weigh-in show. Fighters arrived downstairs at the hotel outside a conference room. They checked in with CSAC and UFC officials, were briefly placed into a waiting area and were quickly brought into the conference room to weigh-in thereafter. No fighters had to wait more than five to 10 minutes to step on the scale, which was actually too long for CSAC executive officer Andy Foster, who was surprised so many fighters arrived right at 10 a.m. to weigh-in. Foster said in the future he will limit the hours from 10 a.m. to noon, because just about every fighter wants to weigh-in as early as possible. He also said he might add another doctor to keep the process moving swiftly. An early weigh-in will likely be the standard in California moving forward. “There wasn’t much of a bottleneck, but I would say a few fighters had to wait five, maybe at the max 10 minutes and to me that’s a little long,” Foster said. After fighters weighed in, they were given water and had the ability to grab wholesome food like fruits, yogurts and protein shakes. Even a little Nutella. Then, they were examined by a CSAC doctor. Cole Miller was the first fighter to weigh-in and Ricardo Lamas was second. The CSAC rules likely won’t become official California laws until next week, but the UFC was open to having UFC 199 be the first event using the new regulations. In addition to the earlier weigh-in, doctors were more diligent in examining fighters for severe dehydration. A hydration scale was on hand and specific gravity tests will be used to test for hydration Saturday before the fight. The goal for CSAC is to not send dehydrated fighters into the cage. Highly regarded MMA nutrition guru George Lockhart, who worked this week with James Vick and others, lauded CSAC and the UFC for this new process. Rather than fighters being on weight for four hours or more waiting for a 4 p.m. weigh-in, Vick and others only had to go downstairs to weigh-in. They only had to suffer at that artificial weight for 10 to 15 minutes at the most. UFC vice president of athlete health and performance Jeff Novitzky said the education process about the perils of extreme weight cutting has already set in with fighters. The UFC is encouraging athletes to come into fight week at 8 percent or less of their target weight. Novitzky said Tuesday when UFC 199 fighters arrived here only four out of the 26 on the card were more than that 8 percent. And those four were not much over, either. UFC president Dana White said Thursday at the pre-fight press conference that there is a concern that more hours to rehydrate will encourage bigger cuts. Novitzky echoed that Friday, but said there is no evidence of that thus far. Foster, Novitzky and others are gathering data for the future Friday and Saturday. Novitzky said UFC officials will meet next to discuss making earlier weigh-ins permanent for UFC events. Commissions in Kansas and Mohegan Sun have already tried out the new regulations, but it hasn’t been passed across the board yet. History was made Friday in Los Angeles. And fighters and coaches are hoping this becomes the norm. It’ll be up to the UFC, other promotions and state athletic commission to band together to give fighters a healthier experience. When we look back five or 10 years from now, a morning weigh-in could very well be the regular practice and we’ll be wondering why fighters were ever made to wait until 4 p.m. to step on the scale. At the UFC 199 weigh-ins, all 26 fighters taking part in Saturday night’s UFC 199 fights will step on the scale Friday evening, and we’ll have the live video here at MMAFighting.com. In the main event, UFC middleweight champion Luke Rockhold and Michael Bisping will have to make the middleweight limit of 185 pounds. The UFC 199 weigh-in takes place at 7 p.m. ET, and the video is above. Check out the UFC 199 weigh-in results below.